Description: Clip art photograph of the USS Mount Whitney and 12 Other Navy Ships in Baltic Sea. 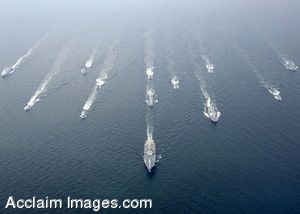 USS Mount Whitney (LCC/JCC 20) leads a formation of ships from 12 countries during the first day of the Baltic Operations (BALTOPS) exercise June 8, 2009, in the Baltic Sea. BALTOPS improves interoperability with partner nations by conducting realistic training at sea with the 12 participating nations. This is the 37th iteration of BALTOPS. (U.S. Navy photo by Mass Communication Specialist 3rd Class Christian Martinez) Clipart photograph by Department of Defense Public Domain.